Death of a Pancreas: Merry Christmas everybody! I just wanted to thank EVERYONE for their kind words, encouragement and support during these past rough weeks. We're still in the midst of it, but that's not what this post is about. I also wanted to say thank you for all the wonderful cards we've been receiving. I'm sorry I was not "with it" enough to reciprocate, but I loved seeing the pictures of all my D-buddies I've made over the past year. You guys have made a very tough journey a little easier and Fred, Elise and I are blessed by every one of you. If you want to see some fun pics of how we celebrated our Christmas Eve, you can click over to my other blog, here. 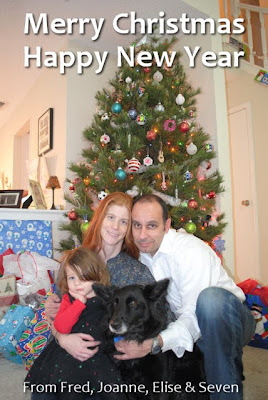 Here's our Christmas picture that sure would have looked cute sent out in the mail, but looks just as cute on my blog. Merry Christmas, I wish God's richest blessings upon you! Cute picture! Merry Christmas to you too! Love the picture and God Blessings upon you and Merry Christmas . Darling picture! Hope your Christmas was great! Merry Christmas! Just wanted to write to let you know I'm a faithful reader. My 12-year-old was diagnosed with Type 1 on January 5, 2009, and we've had quite the year. Even though our kids are different ages, your wisdom and honesty has been a blessing to me as I braved this new "D" world. Thanks for writing, and blessings in 2010. I'm praying Elise's numbers stabilize very soon! Thank you Sallie D! It means so much to me to know that I'm helping others just as much as I have been helped. That was why I started this blog in the first place! You're coming up on your 1 year anniversary, how is your daughter doing with everything? Wasn't this a song from the Lion King?